Flash banners and movies come in lots of flavors and versions. A fair number of the Flash banners submitted to Signs 101 don't work properly. They will display but they may or may not link correctly to your URL or they may not correctly capture the impressions and click statistics that are valuable to you for evaluating your advertising investment. The following should be of help and has been tested. A click tracking method created by Adobe (formerly Macromedia) for rich media banners designed with Flash. It has evolved into an industry standard over the past several years and is today supported by every major ad server. Experienced Flash designers will find implementing the clickTAG method to be fairly simple. In short, you need to insert a transparent button into the top-most layer of your Flash banner and assign it an onrelease action with some special ActionScript code that is designed to accept a click-tracking redirect as a parameter. 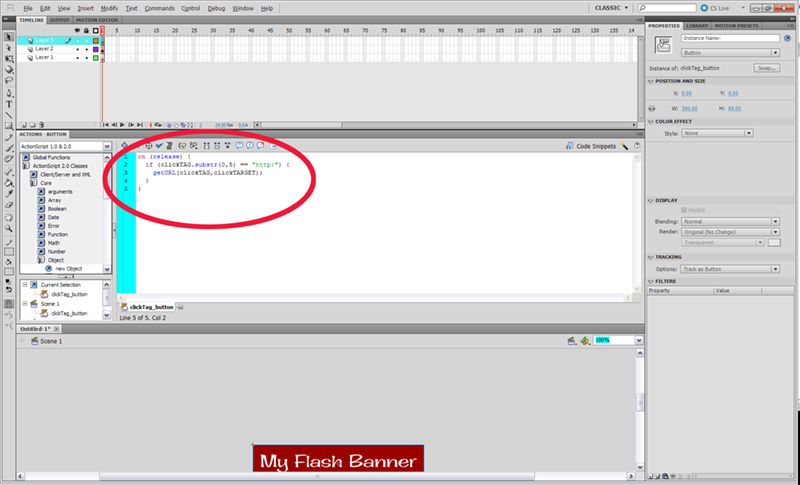 Copy the ActionScript code below for the minimum version of Flash you intend to publish the SWF file for the banner. Which minimum version of Flash should you choose? You should first check with your ad server vendor as they may only support specific versions. If at all possible, we recommend that you choose Flash 9. According to surveys conducted by Adobe, 99.6% of users worldwide have the Flash 9 plugin. Do not make any modifications to the code! It requires absolutely no changes to function correctly. It should be copied and pasted into your banner exactly as it appears. This is ActionScript 2.0 code. Do not export your SWF file for Flash 10 or use ActionScript 3.0 as they are not compatible with this method of creating a clickTAG button. Also, you should be aware that Flash 8 and 9 treat the clickTAG parameter name case sensitively. Make sure enter the clickTAG name exactly as shown here and also verify that all occurrences of the parameter name are exactly them same. If that makes no sense to you, don't worry! We have created the following step-by-step tutorial to walk you through the entire process from start to finish. If you follow our instructions exactly, your banner will track clicks with our ad server. When your design work on your banner is complete, follow these steps to implement the clickTAG button. 1. 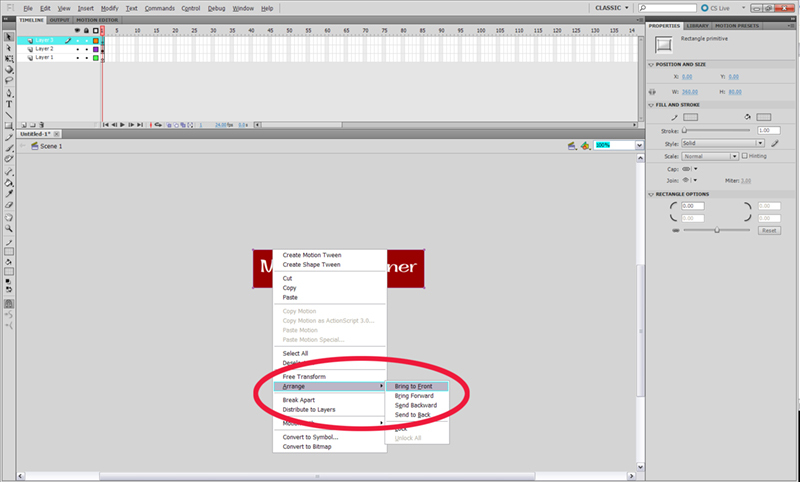 Right click on Layer 1 (or your topmost layer) and then click on Insert Layer as shown in the screenshot below. 2. 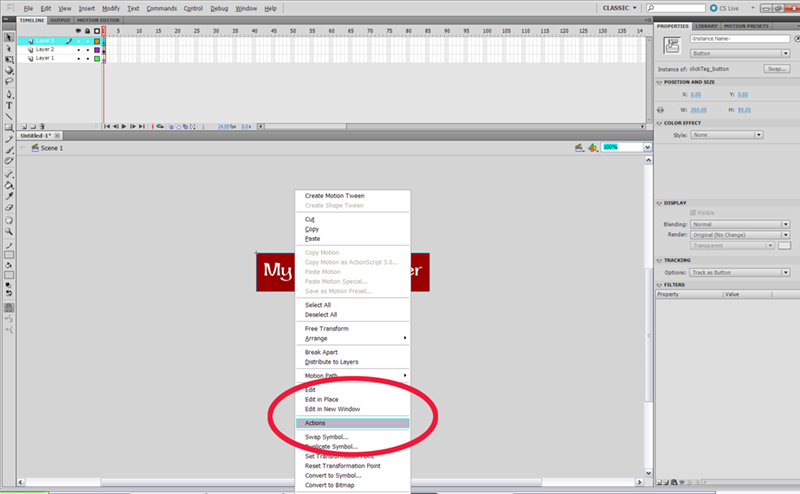 Select the Rectangle Primitive Tool from the toolbar as shown in the screenshot below. 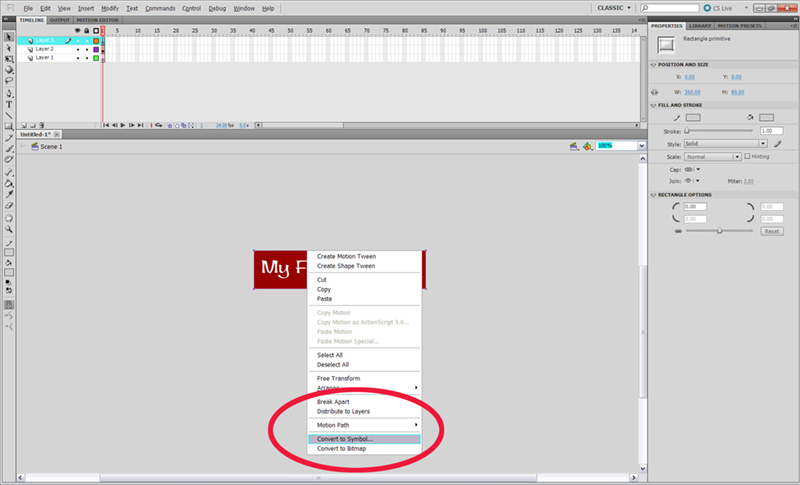 Draw a rectangle of the same size on top of your banner in the New Layer that you just created. Then use the rectangle properties view to change both the Stroke Color and Fill Color to white and set their Opacity to 0%. Doing this will make your rectangle completely transparent as shown in the screenshot below. 3. Right click on your transparent rectangle and then click on Arrange > Bring to Front as shown in the screenshot below. 4. Right click on your transparent rectangle again and then click on Convert to Symbol... as shown in the screenshot below. 5. Enter clickTAG_button for the name of the button as shown in the screenshot below. 6. Right click on your rectangle, which is now a button, again and then click on Actions as shown in the screenshot below. That's it! Please insure that you have set you publish settings to Flash Player 9 and ActionScript 2.0 and save your Flash FLA file. Finally, click on the File menu and select Export > Export Movie. At this point, you may email us the SWF movie along with your desired URL landing page. If you have any questions, please email me or send me a private message. If you exported your SWF file for your banner for Flash version 8 or 9 the clickTAG parameter name is case sensitive. If you did not copy and paste the ActionScript code, verify that all occurrences of the parameter name are spelled exactly as clickTAG. Another common mistake is to replace "http:" in the ActionScript code with a link. The purpose of that code is to verify the protocol of your link is HTTP. That is necessary to prevent your banner from being utilized in cross-site scripting attacks, so you definitely don't want to alter or remove that! Where your link actually goes is in our ad server, which will dynamically inject the link into the banner at the time of serving. No link(s) should ever be embedded in the Flash banner directly. 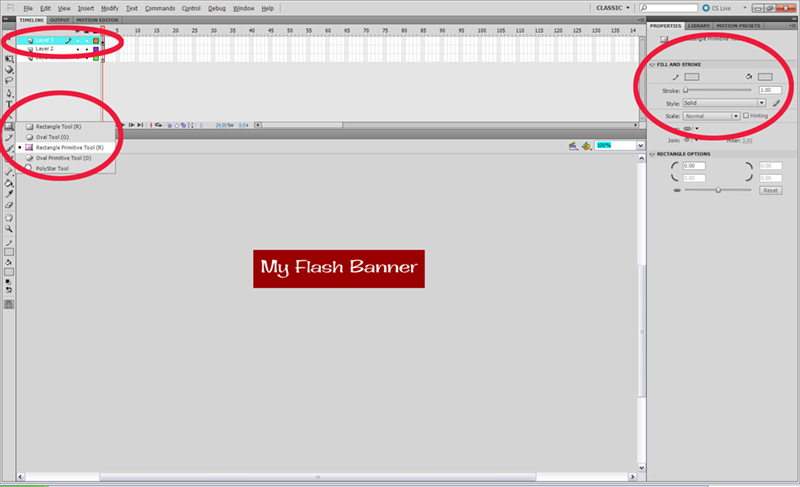 Did you export the SWF file for your banner for Flash version 4, 5, 6, or 7? Internet Explorer versions 7 and 8 when used with Flash plugin version 10 do not permit SWF files exported for those older versions to use _blank for the target frame. They are considered to be pop-up windows and blocked. The best practice is to export the SWF file for Flash 8 or 9.